malta | I'd rather be diving.. This was to be a day of days.. The Um El Faroud is my most favourite of dives in Malta.. One problem stood between me and the Faroud.. We were staying in Gozo. I needn’t have worried though, my compatriots took little persuading to take the short ferry between Gozo and Malta especially when I waxed so lyrical (greased with some cheap vino) the night before..
We were up early and on the way to Mgarr Harbour for the ferry to the “mainland”. I have done this before and sat in a queue that stretched up on to the main road however on this occasion our timing was perfect and we drove through the ferry terminal and directly onto the next ferry as virtually the last car.. The ride over to Malta was swift and trouble free, which should have been the same for the trip down to Wied iz-Zurrieq at the bottom of the island, however the navigator (me) decided to get smart and took the longest route possible, ensuring, in the process, that we experienced the full range of maltese motoring. Now, when I’ve been to the Faroud before we arrived early and parked at the bottom of the (steep) hill, kitted up and trotted the few steps down to the sea. Today, however, because of our late arrival and it being the height of the season there was no room at the inn (so to speak). We managed to get parked down the side street (by the restaurant if you know it) and kitted up there, in full sun and a long way from the sea.. not so bad on the way down but a long walk back ! ..let me digress for a minute.. The entry point to this dive is at a place called Wied iz-Zurrieq which is better known to your land based tourist as the Blue Grotto (or ‘a’ blue grotto – I think there is more than one).. The ever enterprising Maltese will take people (for a fee) from the bottom of the hill in little wooden fishing boats round the headland and into a little sea-cave… then they bring them back. I don’t think I would part with my money for such an experience, I guess it’s a personal preference, but each time I go to the Faroud, it amazes me that people will pay for something which nature provides. They do the same thing at the inland sea.. people pay money and they take them through the “slit” then they bring them back again. ..right, back off my soapbox. To get to the Faroud is reasonably simple, you exit the little bay where you jump in, on the opposite side to your entry point. Make sure the coast is on your right shoulder and then follow a 45 deg angle from the inlet. If you swim at 5m after 10 mins you will start to see sand bars appearing 35m below you. You should also see, off slightly to the right where the reef meets the sand a brass ‘standard’ diving helmet placed there as a commemorative icon to a BSAC club and (possibly) a diver – if memory serves me..
Once you see the helmet and sand bars you can start your descent. The Faroud will loom up out of the blue and you will not be able to see both ends at the same time. Coming from this direction you will hit the stern first. If you are good on air you can do the length of it on the outside and back easily leaving you enough time and air to meander back up the reef. 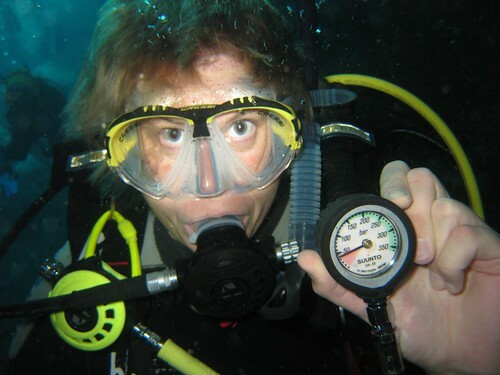 If your air is a little tighter, then save yourself the stress and do it on two dives. Bear in mind, that, if on air you will hit your ND limit quite quickly. We dived on this occasion using 32% nitrox. If you fancy a little penetration then you could easily take 6-8 dives exploring the different levels of the ship. You can get straight into the engine room without too much trouble and generally there is a visible exit available at all times. Prudence, however, is the bed-fellow of longevity.. if in doubt, use a line. The ship is split at 2/3 of her length, this was originally a crack caused during the sinking process. 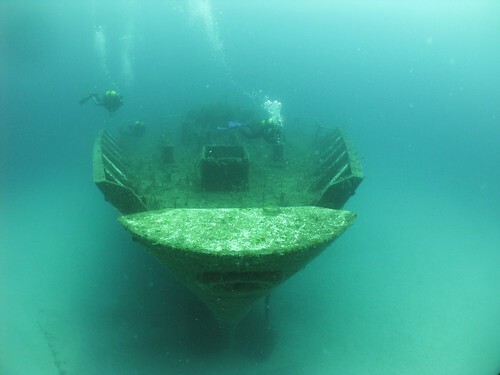 In 2004, however, there was a huge storm off the south coast of Malta which, when the dust settled, had managed to move the entire bow section of the ship approx 20 degs further toward the coast. 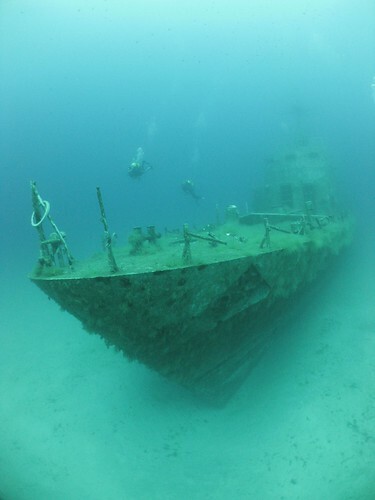 The crack serves to open up the structural bulkheads of the ship and provide access to areas of the hull that otherwise might elude novice divers. It is worth noting that, often, on this wreck there is a current (sometimes raging) which runs from stern to bow. This means that you should pay attention when traveling the length of the ship, your return journey may be harder on the air-supply than your outward one. If this is the case you can leave the ship earlier and head for the reef where the current will be greatly reduced. After reaching the reef keep it on your left shoulder and meander back to the inlet, there is a few small ‘caves’ and inlets on the way to entertain you. In the past I have encountered octopus, cuttlefish, moray and jellyfish whilst decompressing in the inlet. Just remember to keep your head down so as not to trouble the tourists.. If you do dive the Faroud, please take the time to eat at the restaurant half-way up the hill. This is one of those family run places that is not seasonal. They are open all year round and are very diver friendly, you wanna pop in for a pee wearing your wetsuit, they’ll let you.. The food is good, wholesome and reasonably priced considering the tourist traffic they get. In the winter they serve hot-chocolate which is a great after-dive warmer. Believe me, I spent 3 weeks in Malta in November.. it isn’t so warm at that time of year. Suitably sated at the halfway-cafe we set off for Cirkewwa. Thats the ferry terminal on the maltese side of the crossing, which, helpfully is also the site for the Rozi wreck. We planned to dive the Rozi, as I’ve been there before and I knew the way.. When we arrived on the promenade, however, we met some of our party who persuaded us to dive the P29 Patrol Boat. The boat is a newly sunk wreck close to the Rozi tug boat. You get there by surface swimming directly out from the the main slipway sea entrance (i.e. NOT jumping in by the lighthouse) and heading perpendicular to the sea-wall directly for a red buoy. It’s a short surface swim (compared to the double arches) which rewards with one of those descents I love.. Empty your BCD and watch the line disappear down into the depths, you can’t see the ship at this point, just have faith that it will rise up to meet you if you follow the line.. and follow it we did. The P29 is sitting bolt upright on the sand, there is nothing around it, just sand so if it weren’t for the buoy you’d have to follow your compass to navigate there. The ship has been down only a short while so there is precious little growth but the fish life is starting to accumulate, and obviously, the growth will follow. The beauty of diving an early sunk wreck like this is that you can explore the ship as though you were flying through it on the land. This is a diver-safe ship so there are exits cut in all decks, oil and cables have been removed along with the majority of ‘collectibles’ – that doesn’t, however, stop people from trying to remove certain things (e.g. electrical fuses) and smashing running lights etc – an activity I frown upon. If you have a wide-ange lens the bow of the ship provides excellent photo opportunities. Returning from the P29 is simple, go to the stern and follow the line of her starboard running light and you will arrive back at the Cirkewwa reef between the lighthouse and the slipway. Turn right and head up to 6m where you can spend your safety stop looking for Scorpion Fish, there are many, and perhaps (unfortunately) taking the opportunity to clean up some of the plastic detritus left by less environmentally aware visitors..